The biggest subsidies are for housing ($50 billion), the auto industry ($40 billion), and AIG ($35 billion). The next biggest subsidy is for the bank investments that haven’t been repaid ($24 billion). 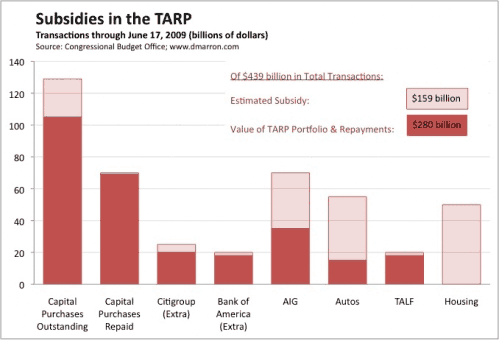 That figure includes subsidies for the original TARP investments in Citigroup and Bank of America. CBO estimates that the additional investments in Citigroup and Bank of America involve subsidies of about $7 billion, of which $5 billion is for Citi and $2 billion is for B of A. The B of A figure may increase, however, when Treasury finalizes a plan to guarantee some B of A assets. 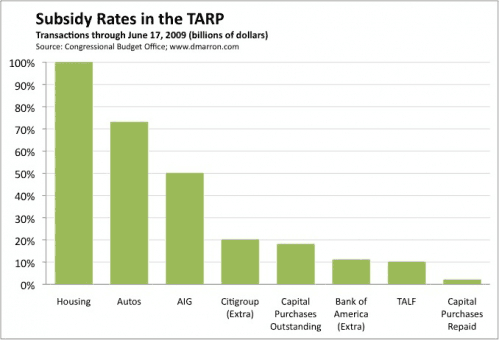 CBO estimates that the banks who have repaid the TARP also received small subsidies. Taxpayers got their money back, but CBO believes that they weren’t fully compensated: dividend yields were below market rates, and taxpayers bore significant risk. (Caveat: CBO’s estimate does not include the value of the warrants that ten big banks will repurchase.) For additional information on the repayments, see this post. These estimates do not include several programs that have been announced but not yet implemented. These include additional support to GM, expansion of the TALF, creation of the PPIP, and support for small business loans. For additional information on these programs, see this post. The subsidy rate for housing is 100%. The housing program is the only part of TARP in which taxpayers do not receive assets whose value might offset some of the TARP spending. The next highest subsidy rates are for the auto industry (73%) and AIG (50%). The subsidy rate for the extra Citigroup support (20%) is almost twice as high as the subsidy rate for the extra Bank of America support (11%). That difference is primarily driven by the asset guarantees provided to Citigroup, which CBO believes involve higher subsidies that the additional capital investment in the firm. Treasury is working on a plan to provide guarantees for some Bank of America assets, so the BOA subsidy rate may change. As noted above, CBO believes that the repaid investments involved a small subsidy. Taxpayers got their money back, but weren’t fully compensated for bearing risk and receiving below-market dividends. This figure may change once Treasury repurchases warrants. Random Fact: Congress originally authorized up to $700 billion in TARP investments. CBO reports, however, the current limit is about $699 billion; the total was reduced by $1.3 billion in a subsequent law. Disclosure: I have no investments in any TARP recipients except Citigroup. As research for my continuing series on the Citigroup anomaly (latest installment here), I am currently long a small amount of Citigroup preferred and short some call options on the common. Is The Roof Falling In On The Housing Stocks?